Is the Premier League Failing Young English Talent? The Premier League is considered one of the best in the world, the best managers, the best players, the best stadiums are all in England with the few exceptions. You could also argue that it is the most competitive league in the world. There is an argument though to suggest with such a hugely rich league that the national team is becoming an utter failure. The players don’t care, the manager isn’t right and the fans feel alienated. To look at how the top clubs are failing their homegrown talent, Chelsea are a prime example they have a huge 14 English players out on loan, and they are talented players too. Tammy Abraham is tearing up the Championship at the moment playing for Bristol City. Lewis Baker is still at Vitesse and performing well, getting himself into the England under-21 side. Kasey Palmer who’s on loan at Huddersfield and has made 21 appearances this season. Tammy Abraham has scored 14 goals this season. This is just one example of the big clubs having their young talent stifled by big price tags and which you could argue can just as easily become flops as they can become stars. The Premier League has ceased to be a breeding ground of English talent, the likes of the Class of ’96 will not be seen again if this buying culture continues. There has to be ups and downs that is the way of the game in football, we need these young stars to come through to make England a strong team again. World football needs a strong England, at the moment England are weak and a disappointment to the nation. We are 18 months away from the next World Cup, Southgate must take a gamble bring in the youth, Rooney’s time has run out, Cahill is not good enough and Jordan Henderson has given nothing to the team. This entry was posted in football, Uncategorized and tagged abraham, baker, big clubs, bristol city, cahill, championship, Chelsea, class of 96, England, english, football, henderson, huddersfield, palmer, Premier League, rooney, southgate, stars, talent, vitesse, young. Bookmark the permalink. West Ham had a good season last year under Allardyce and played some good football, with a good season under their belt they’ll hope to kick on this year under a new manager before they move homes to the Olympic Park. West Ham had a stunning first part of the season and had only lost 3 games by 8th November also had claimed some impressive scalps along the way. Losses to Manchester United, Tottenham and Southampton were nothing to be ashamed of either this run was huge for the London club. They were in the top 4 courtesy of this good form and a high profile 2-1 win over Manchester City on 25th October had rubber-stamped their credentials. They had also beaten Liverpool 3-1 in September they were showing that they were not a club to be taken lightly this astonishing form continued after November as they would only lose 3 more games before the turn of the year they cam in the form of narrow losses to Chelsea, Arsenal and Everton they finished 2014 in 6th place still impressive for the London club that had surpassed many clubs with both a bigger budget and better squad. Sam Allardyce leaves the club after just 1 season. The second half would not be so successful for West Ham between the 31st January until the 25th April the club would only win 1 game as they beat Sunderland 1-0. This amazing fall from grace saw them in 10th place no mean feat for the club as they failed to find the astonishing form which had won them many fans before New Year’s Day. They were still playing attractive, free flowing football but the results were proving hard to come by. They finished the season with 3 straight losses and finished in 12th place. A respectable position but you can’t help but feel had they kept up the pace and not gone off the boil then Europe was a very real possibility. This season could be an important 1 for the club. West Ham have been a club that had rarely looked like it will win games but now they are looking the business. They have played some good games and built a squad around some key players such as the enigmatic captain Kevin Nolan who has been hugely prominent in English football over the last decade it is strange that he has few England caps to his name. Mark Noble is another really big part of the West Ham puzzle and his form at 1 point put him in contention for England. Noble is a truly important player his partnership with Nolan is a real contrast of light and shade which made them so effective for large parts of last season. Although Sakho was scoring a lot of the goals Enner Valencia had a good season for the Hammers he himself netting 5 times. His ability to do things he has no right to do make him a standout player he has this outrageous audacity to attempt things that players should not attempt. Valencia has the ability to turn games on their head I have a feeling the striker will be a huge part of this season. He has a team around him that know how to provide the Ecuadorian with quality ball with which he can dazzle opponents and fans alike. 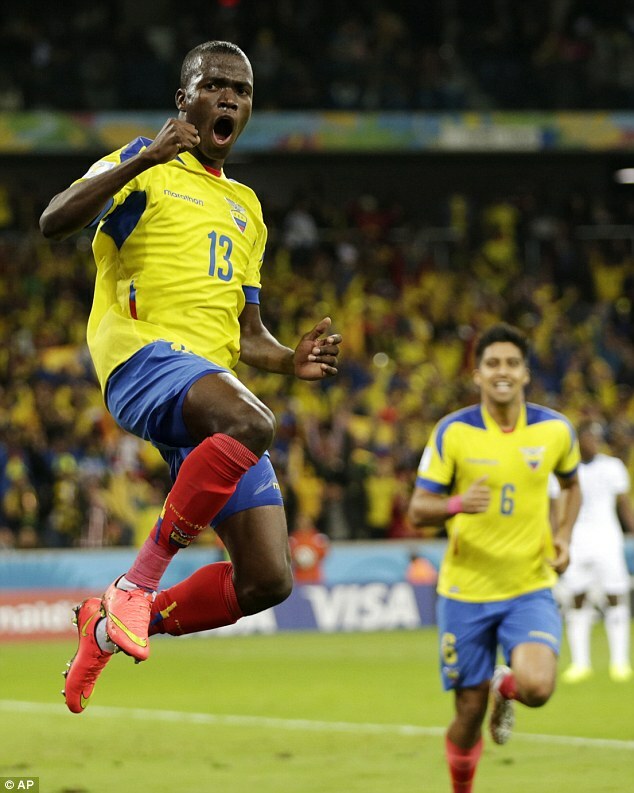 Enner Valencia celebrates scoring a goal for Ecuador. Transfer business a strength for former boss Allardyce, Bilic has made a total of 6 signings whilst 8 players head for pastures new. He has brought in some rathe interesting players as well as bringing in Arsenal defender Jenkinson on loan. Ogbonna from Champions League finalists Juventus is a huge coup. He is a no nonsense centre back, his aerial ability is good and makes him a real handful at the set piece. Ogbonna could be key part of West Ham’s season. Dimitri Payet is a good signing he offers an attacking outlet to compliment the forwards such as Sakho and Valencia he will be a real threat if defenders allow him the space to exploit them with his pace and vicious power. 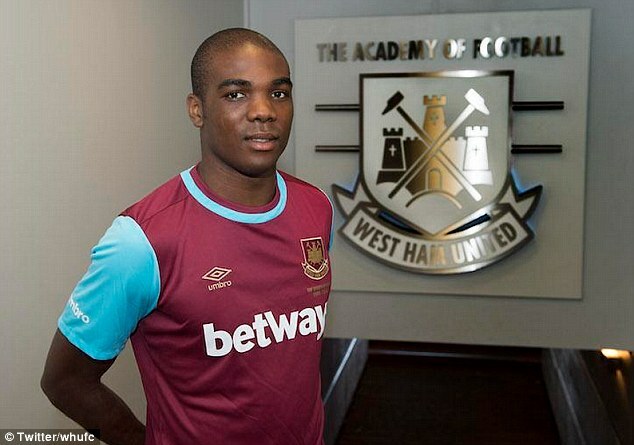 Ogbonna poses after completing his signing for West Ham. Veteran Carlton Cole goes he was just not providing enough to the squad although the former England striker could be a valuable asset to a Championship side. Downing the biggest transfer for West Ham this summer as he heads back to the north east to join Middlesborough an interesting transfer for both clubs he will be missed in London. Some interesting signings and a rediscovery of that early season form could see them produce a stellar season it remains to be seen how much of that was down to manager Allardyce but we will see soon enough. 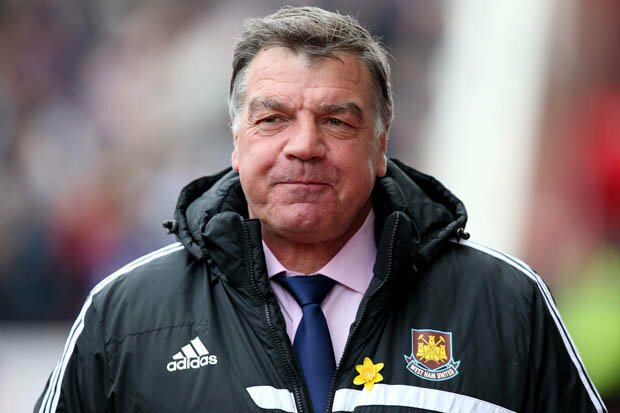 This entry was posted in Uncategorized and tagged 2014, 2015, allardyce, april, Arsenal, attractive, big sam, bilic, boleyn ground, carlton cole, center back, champions league, championship, Chelsea, contrast, downing, ecuador, England, english, europe, everton, free flowing, goals, january, jenkinson, juventus, liverpool, london, Manchester City, manchester united, middlesborough, new years day, noble, nolan, north east, november, october, ogbonna, olympic park, olympic stadium, payet, rediscovery, respectable, sakho, september, southampton, sunderland, tottenham, turn of the year, valencia, west ham. Bookmark the permalink. Norwich the newly promoted team that have the most recent Premier League experience, they have a wealth of talent in their squad which may make them a difficult team to beat over the course of the season. Norwich had a rather strong start to the season in August and September only losing 2 games and recording a win over Watford and a draw with Bournemouth who were both outstanding over the season and at the end were automatically promoted back into the first tier of English football. Norwich racked up a healthy number of points and looked primed to yo-yo back into the Premier League. However it was not to be as their autumn run was a horror show for the club as they could only win 1 game throughout October and November. This saw them slip to 11th in the Championship table having been at the top at the start of October. 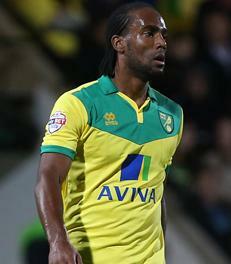 Cameron Jerome netted 21 goals last season in all competitions. The team improved in December recording giant wins over Huddersfield (5-0) and Millwall (6-1). Neil Adams however would depart from the club in early January and Alex Neil joined, Norwich would only lose 3 further games that season. A run of 5 wins over the course of February and March would see some of their best football as they netted 16 goals and only conceded 3, the complete team, their undoubted performance of the season coming at Watford where they smashed their promoted counterparts 3-0 away from home. An outstanding performance. This purple patch also included the 4-0 obliteration of Millwall at Carrow Road, Norwich endured a very strong spell. Through March and April their assault on the top of the table grew stronger with a run of 8 unbeaten games which saw them rise from 5th to 2nd which was a statement of intent from the Norfolk club. They played some absolute crackers over the latter part of last season including their final day 4-2 win over Fulham lifting themselves into pole position for the play-offs which saw Norwich fighting past both Ipswich and Middlesborough to complete the bounce back into England’s top flight. Norwich’s final push for promotion was wonderful to watch as a neutral and if they can produce performances like that in the Premier League will be hard to stop the club surviving the dreaded drop. Nathan Redmond a great player, full of enthusiasm a constant threat both in built attacks as well as on the counter due to his pace. The England under-21 winger has been a mainstay in the Norwich squad for much of the last 2 seasons adding that bit of flair to a team that at times have been lacking. He is 1 of those players that can light a fire inside the Canaries and has steered them to promotion from his spot. The undeniable brilliance of the youngster has been noted by England boss Roy Hodgson, it must only be a matter of time before the pace laden winger earns a call-up to the senior national side. Nathan Redmond celebrates one of his goals. The newly promoted club have only recruited 4 players over the off season. The acquisition of Hull striker Brady is a huge coup, he is a proven midfielder2 at the highest level after his seasons at Hull including loan spells whilst he was at Manchester United where he failed to make an appearance. The 23 year old Republic of Ireland international has been a wonderful player over the past years. They have also brought in the West Bromwich Albion duo of Dorrans and Mulumbu, Dorrans is a super creating player up the middle. Mulumbu adds another top class player to the ranks, both offer not just their quality on the field but also Premier League experience off it for Norwich City. 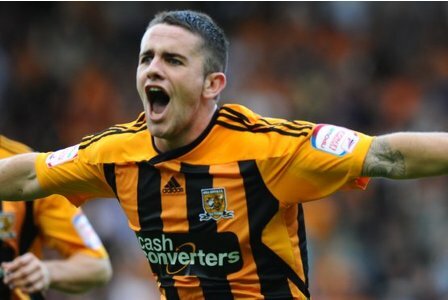 Robbie Brady celebrates a goal for former club Hull. Norwich have offloaded much of the deadwood with very few high profile names leaving bar possibly Becchio the former Leeds man but he hasn’t been at his best for some time. Norwich will be a difficult team over the course of the season will that be enough to stay up? Only time can answer this question, I think that the quality of the Premier League may be too much for Norwich. This entry was posted in Uncategorized and tagged alex neil, becchio, bournemouth, brady, carrow road, championship, city, dorrans, english, football, fulham, goals, high profile, huddersfield, jerome, leeds, middlesborough, millwall, mulumbu, neil adams, norfolk, norwich, play offs, Premier League, promoted, redmond, relegated, russell martin, sport, the canaries, top flight, under-21, watford, yo-yo. Bookmark the permalink. Manchester United have kept van Gaal in charge after a satisfactory season bringing the Red Devils that 4th place and a return to Europe which is what they wanted at the end of last season. Manchester United seemed to have recruited well spending a lot of money on players like former Real Madrid Di Maria being the record signing for the Barclays Premier League he arrived with Luke Shaw, Ander Herrera, Daley Blind and Marcos Rojo all of whom played a part albeit some bigger than others over the course of the season. Di Maria went from being the saviour of souls at Old Trafford to the pantomime villain. From 22nd November van Gaal’s team didn’t fall lower than 4th a very consistent performance from the most successful English team of all time. After Manchester United’s assault on the leaders of the league in March including impressive victories over their 2 biggest rivals Manchester City and Liverpool came unstuck in April as they suffered 3 straight defeats to Chelsea, Everton and West Bromwich Albion which saw Manchester United concede 5 goals and fail to score. These 3 games saw Manchester United fall to 4th behind London club Arsenal a deficit they would fail to recover. Rooney’s leadership over the course of the season has been sensational not just in his leadership but he has also scored a number of sensational goals. The England striker did seem to go off the boil in front of goal towards the end of the season but he still led his club to 4th and the fans have their faith restored in the world class squad. Di Maria celebrates scoring a goal with captain Wayne Rooney. Despite the money spent of Luke Shaw and Angel Di Maria they couldn’t be consistently brilliant, pre-Christmas Di Maria was the hero after Christmas the devil. Shaw the young English fullback was not given nearly enough game time to build on last season where he had a wonderful season for Southampton who suddenly burst into life last season despite the raids on the young riches available on the south coast. The question was would van Gaal spend the money more wisely come this summer and be able to build on the 4th placed finish they achieved last time out. Manchester United needed a player to step up last season, there was a lot of fanfare for David de Gea who did a wonderful job despite the poor excuse of a defence that he plays behind. Only God knows why van Gaal insists on buying midfielders rather than a solid centre half. My player of the season for Manchester United though has to be Fellaini, the midfielder became a monstrous presence for United in the midfield, directing play aerially or otherwise. A long ball style was adapted by Manchester United mid-season and that really helped the Belgian achieve what he set out to when he was signed by former boss David Moyes. Fellaini is now rightly regarded as one of the best midfielders in the Premier League, his excellent displays of power and aerial ability did seem to fall a little limp as fatigue set in but we are sure to see these displays come to the fore once again most probably over the winter months. 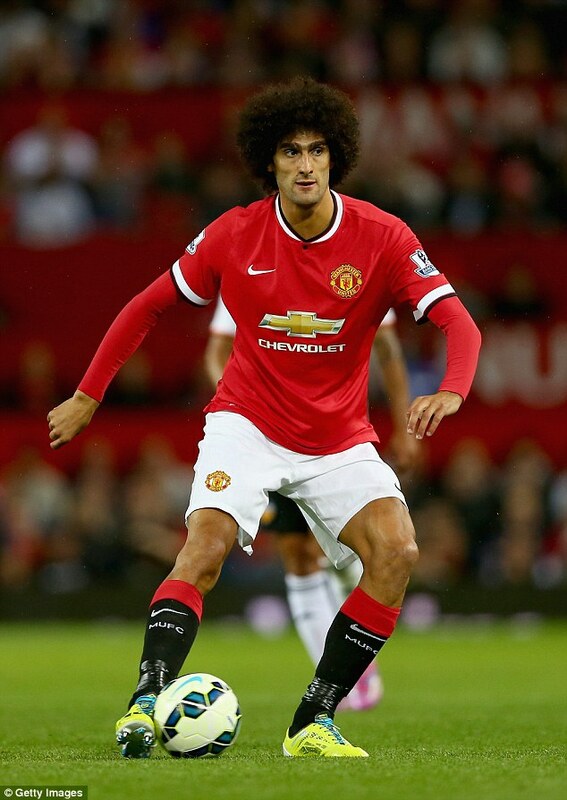 Marouane Fellaini on the ball for Manchester United. Recruitment of expensive players a theme of van Gaal’s tenure at the helm so far bringing in players like Di Maria and Shaw for inflated prices and the Dutch manager has brought in a fair few players again. Bastain Schweinsteiger, Germany World Cup Winner and former Bayern Munich captain is amont the new names on the United roster. The midfielder brings both experience and a wealth of class, his passing game and organisation are outstanding, his success could breed a new generation of success and achievement at the club. Another midfielder is French maestro Schneiderlin who has been outstanding at Southampton over the past few seasons, key to the success at St Mary’s. The French midfielder made 230 appearances for the Saints and became a club hero, he will hope to repeat that feat in the north west. Dutch youngster Memphis Depay also arrived over the summer, the talented forward is likely to be deployed alongside former England whizzkid Rooney in what is shaping up to be a very deadly attacking force that could rival Manchester City and Chelsea. Matteo Darmian finally a player United actually need came in the defender will provide a solid choice to play in defence to help out the mediocre centre backs at Old Trafford. All their signings at profile as they also add Argentina international Romero to the ranks and after his World Cup in Brazil you can understand why, the shot stopper had been brought in because they feared the departure of De Gea but he’s staying so now van Gaal has 3 international keepers to choose from. Schweinsteiger lifting the World Cup for Germany. The saga of De Gea staying or going took a long time to sort itself out which depended on the future of defender Ramos at Real Madrid. Di Maria is on his way out it would seem as every day he edges towards a move to the French capital to link up with stars like Ibrahimovic and Silva. This is yet to be confirmed but I doubt the Argentine player will be staying in England. Colombian striker Falcao has gone on another loan this time to Chelsea another high profile flop for Manchester United. Van Persie heads abroad after failing to make an impact this season and with the signing of Depay the writing was on the wall for the Dutch international. He heads to Fenerbahçe along with Nani who never really won over the crowd in Manchester. Tom Cleverley has also left heading for Everton in another move for a United flop. So Manchester United have recruited well and add to a fairly strong squad already. If van Gaal can get United on the right path building on last season is possible however with the way Manchester City, Arsenal and Chelsea are looking I strongly suspect Manchester United fans will be left disappointed. This entry was posted in Uncategorized and tagged argentina, Arsenal, barclays premier league, bayern munich, belgian, brazil, Chelsea, christmas, cleverley, colombian, daley blind, de gea, defender, deficit, depay, di maria, dutch, England, english, europe, everton, falcao, fans, fellaini, fenerbahce, flop, france, french, fullback, herrera, ibrahimovic, liverpool, louis van gaal, luke shaw, Manchester City, manchester united, march, matteo darmian, moyes, nani, november, old trafford, paris, psg, ramos, real madrid, red devils, rojo, romero, saints, schneiderlin, schweinsteiger, Silva, southampton, st marys, striker, successful, van persie, wayne rooney, west bromwich albion, winner, World Cup. Bookmark the permalink.